The first art for Daredevil season 3 has arrived online. Daredevil was the first live-action Marvel series to debut on Netflix and, quite arguably, remains the best of the bunch. Season 2 introduced us to The Punisher and took some big leaps forward and now, the third season is in production and is set to debut on Netflix later this year. While we still haven't seen any footage from the highly-anticipated new season, the first piece of Season 3 art has arrived online, showing the titular hero taking a leap of faith. This Daredevil season 3 image was released by Marvel Entertainment's Chief Creative Officer Joe Quesada. Taking to Twitter, Quesada decided to give fans just the smallest of teases by showing off this bit of art, which should make Marvel Comics fans rather happy, as it looks reminiscent of some of the best Daredevil comics, such as Frank Miller's legendary run with the blind Hell's Kitchen hero. 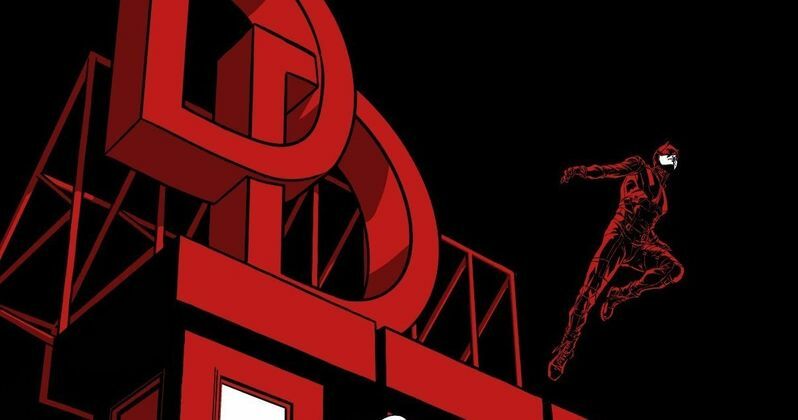 We see the "DD" logo on top of a building, with Daredevil heroically leaping off of it to the streets below. There's a relatively subtle Netflix logo above one of the buildings as well. Quesada seemed excited to share the art, based on his caption. "How about a little DD season 3 art!" Marvel and Netflix renewed Daredevil for a third season back in 2016, but it's taken a while to actually get things in motion. Much of that had to do with getting The Defenders finished up. They also had new shows to launch, including Iron Fist, which didn't go over so well, and The Punisher, which went over about as well as anyone could have hoped. There's also Jessica Jones season 2 and Luke Cage season 2 on the way this year, so Marvel had a lot on its plate. In any case, Daredevil season 3 is coming our way at some point this year, but a release date has yet to be announced. Specific plot details are being kept mostly under wraps, but it looks like this season will be based in part on the classic Born Again storyline, which was written by Frank Miller and is considered to be the seminal Daredevil story. We also know that Vincent D'Onofrio is coming back as Wilson Fisk/Kingpin, which is good news as he's one of the best villains that any live-action Marvel project has ever produced. He showed up in Daredevil season 2 as well, but his role was reduced from what it was in season 1. In addition to Vincent D'Onofrio's Kingpin, the core trio of Charlie Cox (Matt Murdock/Daredevil), Deborah Ann Woll (Karen Page), and Elden Henson (Foggy Nelson) are all set to return. Joanne Whalley was announced as one of the new cast members, coming into play Sister Maggie, who is revealed to be Matt's mother in the comics. Daredevil season 3 will be the first with Erik Olson (The Man in the High Castle) as showrunner. He'll also serve as executive producer on the new season. Be sure to check out the new Daredevil season 3 art, courtesy of Joe Quesada's Twitter account, for yourself below.